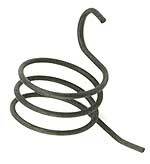 This is the steel hand brake band without the lining installed. Spring clips and mounting clips are installed on the band. Made in USA. Priced individually. This is the steel emergency brake band complete with the lining installed. Spring clips and mounting clips are installed on the band. Made in USA. Priced individually. 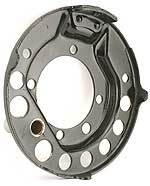 Hand brake lining Set for the 1928-31 Model A Ford. Comes complete with 2 linings and enough rivets to rivet in place on your old bands. Made in USA. 1928-31 Hand brake retract springs. Set of 4. Hand brake toggle link for the 1928-31 Model A Ford. You will need two of these per wheel. Made in USA. Hand brake connecting lever in pressed steel, for the 1928-31 Model A. Connects the emergency brake toggle lever to the two toggle links. Need 2 per car. Made in USA. Hand brake connecting lever in forged steel for the 1928-31 Model A. Connects the emergency brake toggle lever to the two toggle links. Need 2 per car. 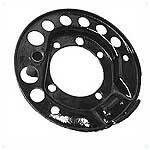 This is a quality forged part that has been made from the original ford print, Made in USA. These are the special pins for hooking all of the emergency brake links together inside the drum. Made in USA. 8 peice Set. Toggle lever for the Model A Ford hand brake. This is the arm that goes through the backing plate. The lever that the brake rod attaches to slides over the end of this shaft with a key-way. It is an import, but of excellent quality. Shaft is drilled and end is tapped for a grease fitting. Hand brake toggle lever shaft housing complete with the bushings installed. Must be welded or flanged to your old carrier plate. Hand Brake carrier for the right side of the 1928-31 Model A Ford. Quite often this part is missing or mangled beyond use! These are brand new units not rebuilt. New bushings are installed in these units. Right is drivers side on a RHD car. Hand Brake carrier for the left side of the 1928-31 Model A Ford. Brand new units not rebuilt. New bushings are installed in these units. Left is passenger side on a RHD Model A. Right side hand brake lever for the 1928-31 Model A. This is the cast lever that the emergency brake rods hook onto at the rear backing plates. Very nice quality! Left side hand brake lever for the 1928-31 Model A. This is the cast lever that the emergency brake rods hook onto at the rear backing plates. Hand brake lever mounting set. These are the bolts to mount the emergency brake levers on the toggle levers. Made in USA. Hand brake lever spring set for the 1928-31 Model A. These two springs install on the brake shaft outside the backing plate and return the levers to the home position. If you have an early 1928 with the emergency brake handle hole in the sub rail, this plate will block off the hole if you change to the later style braking system. Made in USA. Push Button Style hand brake for the 1929 Model A Ford with the handle mounted in Front of the gear lever. Chrome plated. Note: There are three different styles, please check you have chosen correctly. Squeeze style hand brake lever which mounts to the Front of the gear lever on the 1928-29 Model A Ford. The squeeze style handle was used June 1928 to Dec. 1928 and mounted in front of the gear stick. (Also fits right hand drive Model A, with handbrake lever on left of gear lever). This is a duplicate of an old accessory that was around when the A was new! Mounts on A-2780-C style emergency brake levers and makes releasing the handle easier and easier to reach! Chrome plated. Made in USA. Hand brake handle clamp bolts for the 1928-29 Model A. This bolt is used on the handles that are mounted to the front of the gear shift to clamp the handle to its shaft. Made in USA. Hand brake handle pivot bolt for the 1929-31 Model A. The bolt with the special thin head and castle nut for handle that mounts on the side of the transmission. Made in USA. This is the felt washer goes onto the pawl rod inside brake handle to eliminate rattling. You can use a coat hanger to push it up into bottom of the handbrake lever. The early style Hand brake pawl rod for the 1928-29. This is the rod that runs inside the brake handle. Made in USA. 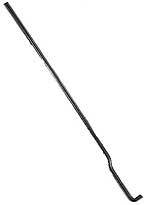 Hand brake pawl rod for the later 1929-31 Model A. 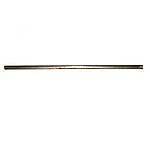 This is the rod that runs inside the brake handle. Made in USA. This was used on the early 1928 Model A with the lever mounted on the left side of car. Made from #4140 steel and heat treated to RD56 hardness. Made in USA. These are made from #4140 steel and heat treated to RD56 hardness. You'll never have to replace this again. Made in USA. 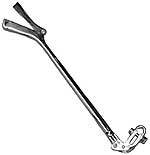 This one is used on squeeze grip style handles mounted to the front of the gear shift lever. This pawl is used on push button style emergency handles mounted to the front of the gear shift lever. These are made from #4140 steel and heat treated to RD56 hardness. 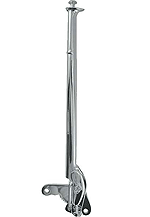 This style pawl is used for the push button style emergency levers that are mounted to the right of the gear shift lever. Made from #4140 steel and heat treated to RD56 hardness. Made in USA. This is the special clevis pin for attaching the rod that runs from the cross shaft to the emergency brake handle. Also holds the pawl in place. Made in USA. The spring inside the Model A Ford hand brake lever that locks the pawl rod in place. Made in USA. Hand Brake Ratchet for the 1929-31 Model A with the push button lever. This is the piece of the hand brake lever that bolts to the transmission. Use with A-2786-DR pawl. US made and heat treated for long life. For brake to right style brake levers. Economy cadmium plated version of the above hand brake ratchet for the 1929-31 Model A with the push button lever. This is the piece of the hand brake lever that bolts to the transmission. These are used with the A-2786-DR pawl. For brake to right style brake levers. This style of hand brake handle ratchet was used on the 1928-29 Model A, with the squeeze type lever, mounted to the front of the gear shift lever. This is the special flat head screw that holds the A-2795-AR ratchet to the transmission tower. 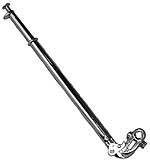 Hand brake cross shaft 1930-31. This is the shaft only, it DOES NOT include any levers. None of these levers are being reproduced, you will have to use your old ones. Holes are already drilled. This is the style of cross shaft that goes through the frame. Made in USA. Pair of hand brake cross shaft bushings for the 1928-30 Model A. These are brass bushings that go at the ends of the emergency brake cross shaft and are used on the style of cross shaft that mounted between frame rails. 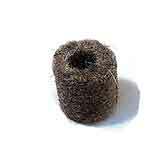 If your cross shaft uses the round "ball" shaped bushings, use A-2477 or A-2477-B bushings. Made in USA. These felts are used on the emergency brake cross shafts that mount between the frame rails. They slip over the balls on the end of the cross shaft to keep the grease in. 2 are required. Made in USA. Hand brake cross shaft bracket for the 1928-30 Model A, to hold the emergency brake cross shaft that mounted inside the frame rails. Powder coated black. Two of these will be required. Made in USA. Hand brake cross shaft bolts, nuts and washers to bolt the emergency brake cross shaft brackets to the frame. Made in USA.